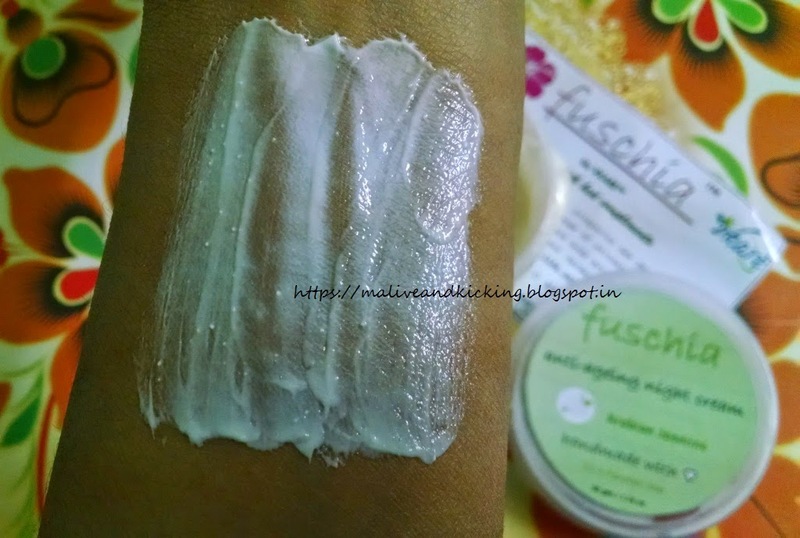 Remember I have been using some beautifully crafted skin / body care products from Fuschia and also gave my opinion on the same in some previous posts. As the year 2015 began, Fuschia surprised me with some thoughtful gifts with a lovely message. I had been reading about their planning to launch a new range of products, but didn't expect that I will be lucky enough to receive them before anyone else could order it ;) Lol. 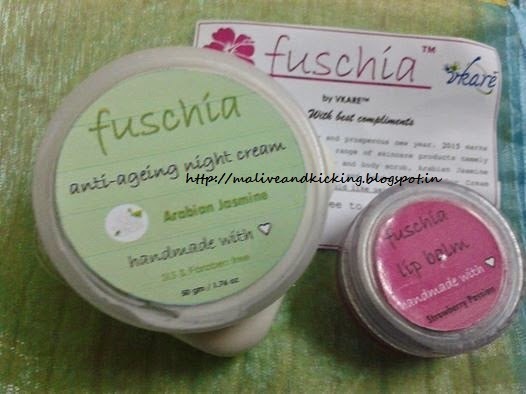 Fuschia launched five brand new products namely Exfoliating Body and Face Scrub, Day Cream with SPF15, Arabian Jasmine Anti-aging Night Cream, Strawberry Passion Lip Balm and Cherry Caramel Lip Balm. 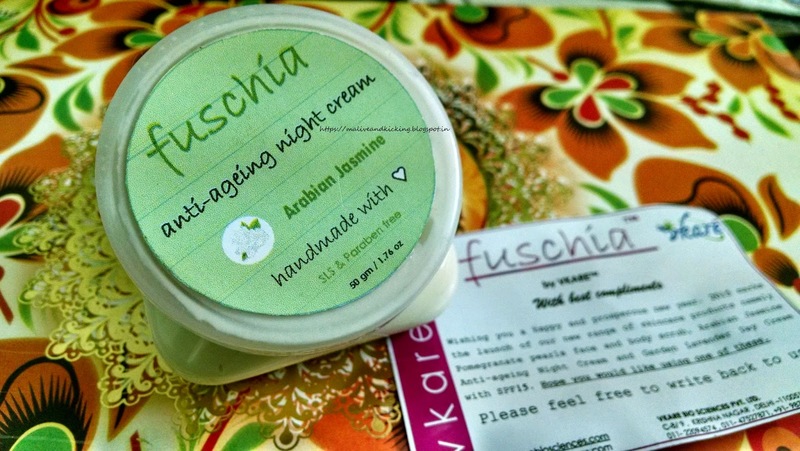 So here I reveal what I received in my pack from Fuschia ..
Out of these two products, I am reviewing the Arabian Jasmine Anti Ageing Cream today. Why to use a night cream? Many of my friends think that if they are already using an effective day cream or moisturizing lotion onto their skin, why do they need to apply a separate night cream? Frankly speaking, I also had the similar thinking long ago. But now I'm aware of the reality that a night cream applied before bed time is something that our skin needs to increase the skin renewal rate during our beauty sleep. 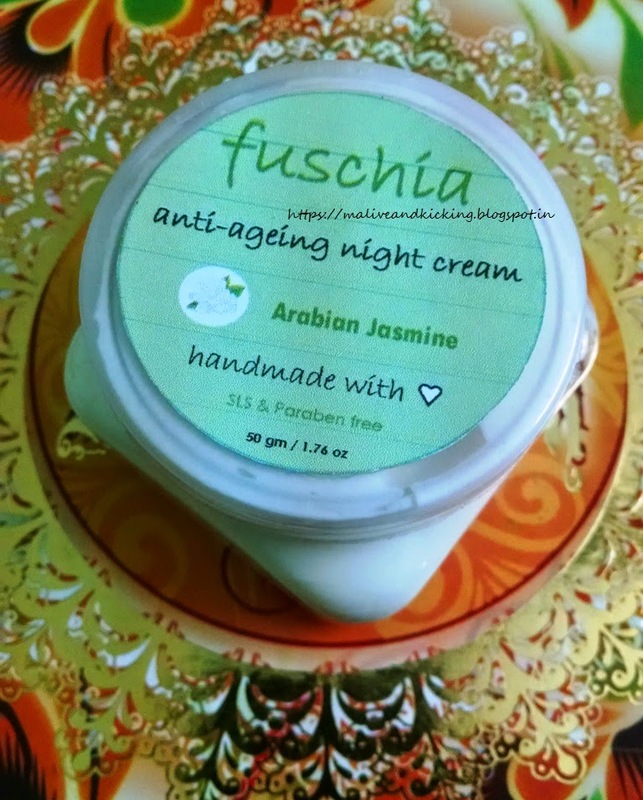 The Fuschia Arabian Jasmine night cream comes in a transparent plastic tub with screw cap. The cap bears a sticker mentioning the product name and quantity on it. 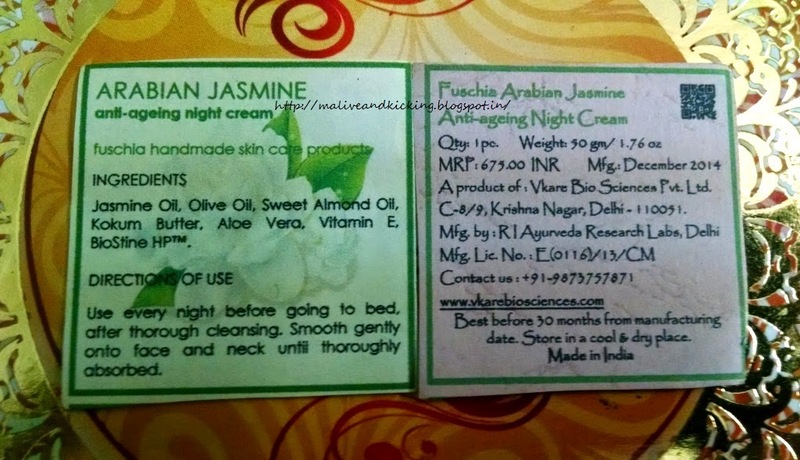 The product is accompanied with lil descriptive cards that elaborates what all has gone into making this cream. constituents like Jasmine Oil, Olive Oil, Kokum Butter, Aloe Vera, Vitamin E, Sweet Almond Oil and BioStine HP. The list of constituents includes all essential oils that help keeping the mature skin free from sagging with their distinct properties. The BioSTine HP is used to offer maximum moisturizing efficacy to skin. The pack of 50 gms is priced at Rs 675/- which is suggested to be used safely within 30 months from the date of manufacturing. The cream is in pearly off-white color and is somewhat as light as of the consistency of whipped cream. Though I was damn sure that this night cream is safe to apply directly on face, still I did a patch test on my wrist to check for any irritation etc. Thank God! it didn't cause me any type of itching or discomfort on skin. As per the instructions to use the cream, I cleaned my face with a mild cleanser first of all and then applied the required quantity on my face and neck area. I needed to rub the cream gently for a while to allow its proper penetration into skin. The fragrance of Jasmine Oil worked wondrous for me as it with its calming effect while sleeping. The product claims to flush out the toxins accumulated in skin through out the day and reduce fine lines and wrinkles. I cannot exactly comment on the effectiveness of the cream on wrinkles bcz I have no wrinkles on my face as yet, but after a continuous use of almost two weeks I have experienced that it reverse dryness from my overly dry skin with its intensive moisture that lasts all night on my skin and improves overall skin texture. A few pleasing compliments n remarks from colleagues have confirmed the visible result on my face as the skin looks firmer & sufficiently rested. Not much quantity needed for single use. Provides radiant glow to the skin. Available at Fuschia's website here and at many other shopping portals. Can be used by men n women both. This Fuschia anti-ageing night cream is suited for those whose skin tone tends towards dryness, as well as for those with normal skin who want to prevent skin damage and wrinkles. It synchs with your skin’s sleep cycle at the time when your skin is most receptive to beauty treatments. 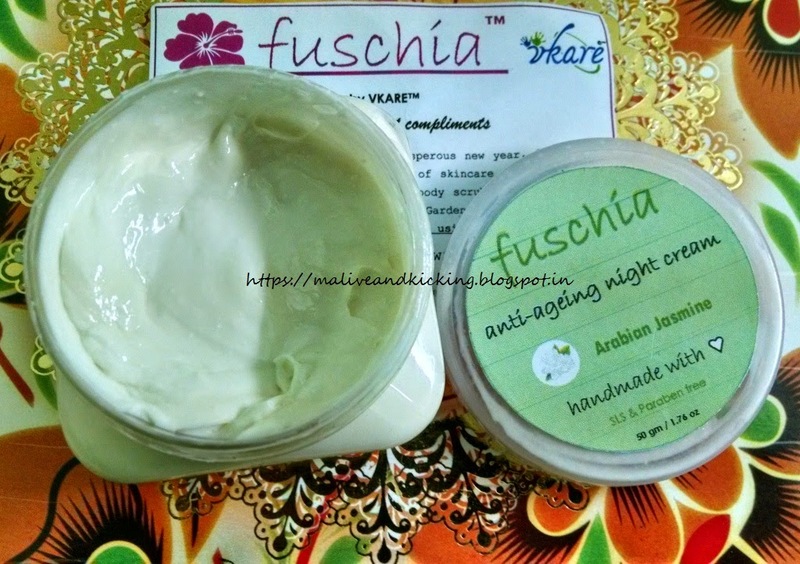 Apply the Fuschia Night Cream every night and wake up to skin that looks revitalized & restored to youth again :) I am determined to buy and use it regularly in future also. me too love jasmine fragrance.